In the Sacred Heart, Robotics Club students are learning how to solve and overcome challenges by working as a team to identify and resolve various problems. They are designing, building and programming their very own robot. This robot will be assigned various tasks such as moving forward and backward, picking up a ball, and carrying this ball from one place or another. This is the first year for the Sacred Heart Robotics Club. Their primary goal is for students to build a robot that will compete at competitions. The challenges in the competitions will change every year. For this academic year, 2018-2019, the Robotics Club has been challenged to build a robot that can pick up objects, such as a ball, and carry it to the end of the course. 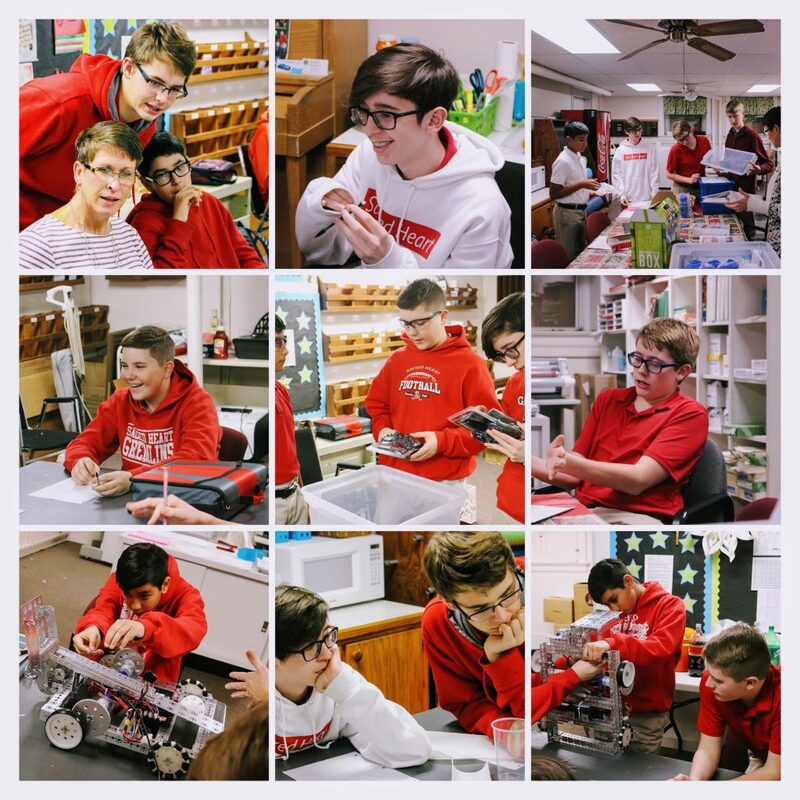 “I like the challenges that come with building the robots and trying to figure out how to fix it,” remarked Hunter Deresinski, Sacred Heart Junior. The Robotics Club differs from Lego League in that there are no preset instructions. The students design, build, and program their robot to fit the challenges it will be facing. “I like making something from scratch and seeing it work the way it was made to,” commented Joseph Henke, Sacred Heart Junior. Although Sacred Heart is not competing this year, 2019 is a practice run to see how it all works and learn how to do it better next year. The Robotics Club will be competing in the competitions next school year, 2019-2020.